- FrancesCassandra: UK fashion, beauty and lifestyle blog. 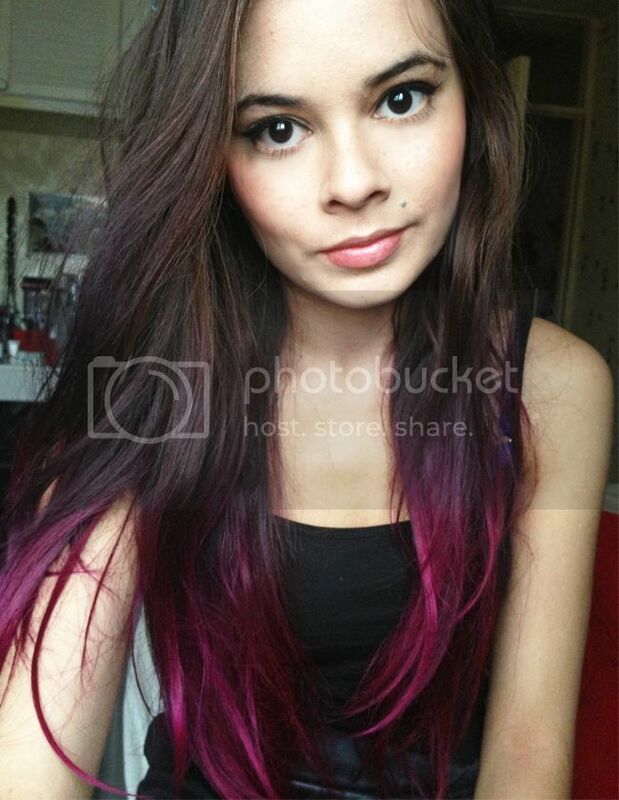 : Pink and Purple Dip Dye. When I did my pink and purple dip-dye a few weeks ago, I had a few people ask me how I did it so I just thought I would type up a quick post on it. The hair dye I used was Directions, which can be bought online or at "alternative stores" (Afflecks in Manchester or Quiggins in Liverpool if you are in the Northwest). It is pretty cheap, costing around £3.50-5 for a 88ml tub, which contains enough product for 3-4 uses for me. Directions hair dyes come in loads of different bright colours, and they're really handy as they don't need to be mixed and can be kept for up to a year after opening. The shades I used were "Plum" (purple) and "Rose Red" (pink). The disadvantage to this product is that if you have dark hair, you will have to bleach it before you use these hair dyes as they won't show up on darker hair colours (although they will tint it, if that's what you're after). I didn't want to bleach my hair any further so I just used it on the dip-dye that I already had, which was more of a copper shade than true blonde. I was happy with how the colour turned out, although the purple didn't show up amazingly well, but it was applied where my dip-dye got darker. I achieved the look using my fingers (wearing gloves, of course! ), and dry hair. Using a tint brush may be easier for some; it's up to you! I started with the purple shade first, rubbing it in to the top part of my dip-dye and making sure that I really worked it in around the transition between the purple and my natural hair colour so that it would gradually change colour and so that there were no harsh lines. I then rinsed off my gloves and started again with the pink dye, this time applying it to the ends of my hair, again making sure I really blended it in and overlapped it where it met the purple dye. Once I was finished I wrapped my hair in tin foil in sections to prevent myself from making a mess everywhere. I rinsed the hair dye off after fifteen minutes, which is what the tub recommends. Please be warned that you will be stood hanging your head over your bathtub for quite a while; the water NEVER seemed to want to run clear- I was still having purple baths a week later! 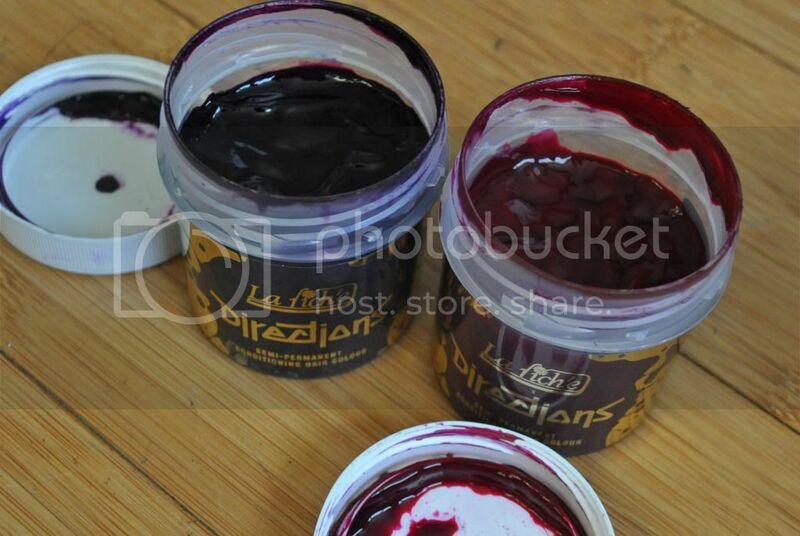 Directions hair-dye is semi-permanent, meaning that it will last around a month in your hair. I found that I needed to re-dye my hair after around three weeks as it was starting to fade and looked like I had dyed my hair a strange, pukey colour, haha! I hope this post helped you if you are planning on doing this. I think I want to try a different colour next time, what colour do you think I should try? oh looks amazing ! I've wanted to try this for such a long time after seeing demi lovato rocking the Pink " hair ends ". LOve it...it really looks great. did you bleach your hair 1st? omg this looks stunning! im trying mine now..hope it turns out like that but i'm not bleaching it! what damages your hair in hair dyes,whats the best one to get? your hair lokk really really amazing!!! maybe you should try red directions, thats also very nice!!!! You look very lovely Frances, thanks for your little mini review!